The Holiday Show has decided to cross the borders into the Western Cape and we are Proud to announce our participation in the first ever Cape Holiday Show, which has been very successful in Gauteng for the the last few years. Showcasing leading caravan, bush and camper vans, camping equipment, a must visit for enthusiasts and those wanting to explore. With the large choice of exhibitors anywhere in the SA and a huge variety of holiday options on offer, the Rapport Show will inspire you to discover new destinations and adventures from our expert exhibitors, both local and abroad. This is an exciting step forward for us in our vision to get our great product out to YOU, the public, and make everyone aware of using Eco Logs and not to cut down trees for Fire and BBQ wood. 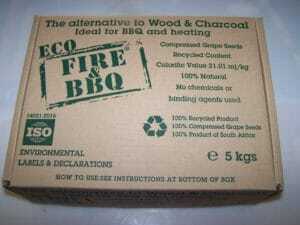 This is a fantastic alternative to wood and charcoal, with benefits of long lasting coals, burning clean, burning hot, no binding chemicals used and many more. Our commitment in reducing the impact on the environment is clear with our production of the 100% Compressed Grape Seed Logs, by using the by-product in the grape seed oil manufacturing process. Visit our Stand, S8, where we will display our product and visitors are able to purchase this fantastic product. By purchasing the Eco Logs, you are doing your part for a clean and healthy environment and the product Works! You will be able to buy tickets online, when following the link below by clicking on the picture. Your online ticket will allow you preference at the entrance gates.